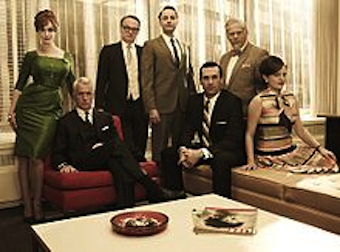 The Mad Men effect: is the hit show responsible for increases in whiskey and cigarette consumption? It seems we’ve all been a little more influenced by the hit television series Mad Men than first realised. New research from Roy Morgan says that whiskey is becoming increasingly popular among Australians in their 20s and early 30s, causing marketshare shifts among the top whiskey brands. In 2006, Australians aged over 65 were the most likely to drink whiskey (10% in an average four weeks) and those 18-34 were least likely (8%). But from 2007 (which happens to be the same year as Mad Men first aired), consumption rates in younger groups began to climb: the proportion of 25-34 year olds drinking whisky has grown by over 50%, from 8.6% in 2006 to 13% in the year to September 2013. The show has also been blamed for the increase in sales of the cigarette brand, Lucky Strike, which is featured heavily on the show. Sales of Lucky Strike increased from 23 billion packs in 2007 to 33 billion packets in 2012. Australians now drink almost 19 million glasses of whiskey in an average four weeks – around three million more glasses than in 2009 – with the average consumption rate fairly steady at just shy of 10 glasses per whiskey drinker. 25-34 year olds are now the most likely group to be whiskey drinkers, followed by 18-24 year-olds (11.9%), with penetration in 35-49, 50-64 and over-65 groups remaining comparatively steady. Source: Roy Morgan Single Source (Australia), Oct 2008 to Sept 2009 and Oct 2012 to Sept 2013, average sample size n=1,948 Whisky Drinkers 18+. Numbers may not add to 100% due to rounding. And as whiskey drinking changes, so do the market shares of major brands. Nationally, Johnnie Walker Red is the market leader with 22% ‘share of throat’. Of the 18.7 million glasses of whiskey Australians drink in an average four weeks, almost 4.2 million are Johnnie Walker Red. 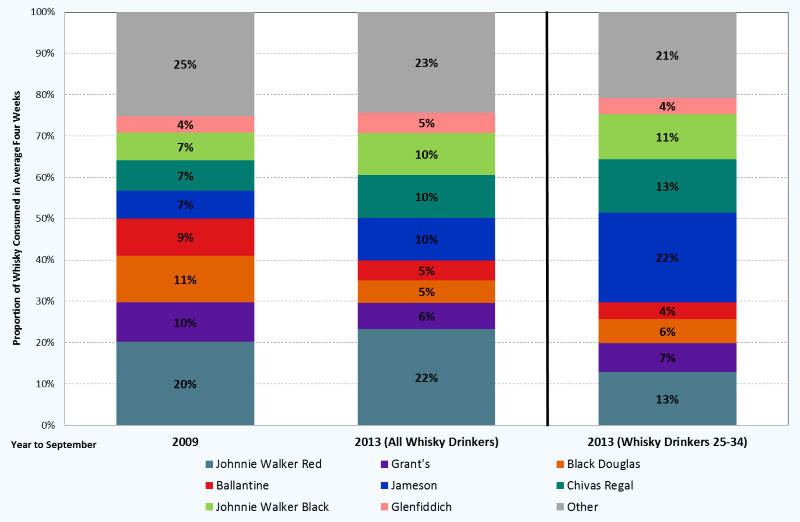 The market share of Grant’s, Black Douglas and Ballantine have all substantially declined over the past five years and been overtaken in popularity by Jameson, Chivas Regal and Johnnie Walker Black – the latter each now with 10% market share. But among 25-34 year-old whiskey drinkers, Jameson replaces Johnnie Walker Red as the most popular brand, with the two almost switching market share numbers. In this group, Jameson claims 22% of the market to Johnnie Walker Red’s 13%. In fact, half of all glasses of Jameson poured in an average four weeks are drunk by 25 to 34 year olds. Johnnie Walker Red’s share in the 25-34 bracket is equal to that of Chivas Regal, and only just ahead of Johnnie Walker Black’s 11% share. “In the whiskey market, not only are consumer preferences changing, but consumers themselves are changing. Perhaps as Don Draper and his colleagues are watched sipping high-end whiskey in hit TV show Mad Men, consumer trends have shifted from mainstream whiskey brands to more premium brands, particularly in the growing 25-34 segment,” says Angela Smith, group account manager – consumer products, Roy Morgan Research.